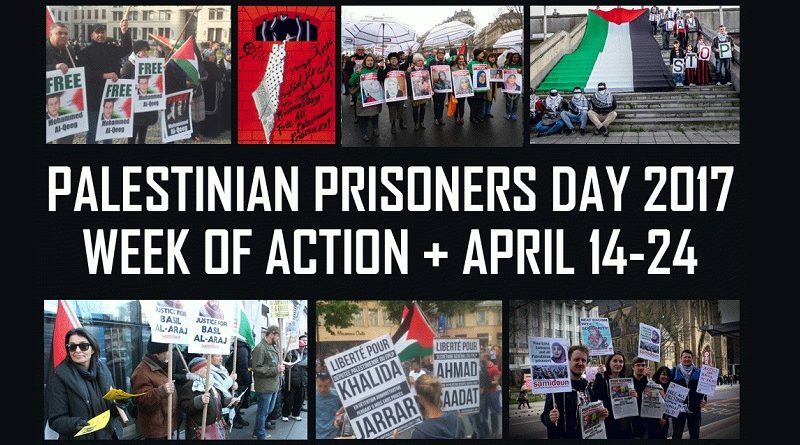 Organizing an action for Palestinian Prisoners’ Day? Send your events and actions to us at samidoun@samidoun.net, on Facebook, or use the form to tell us about your actions. We will be publishing an international list of events and actions for Palestinian Prisoners’ Day. This date is one of protests, rallies, marches, forums and actions to commemorate, support and build solidarity for the struggle of imprisoned Palestinians. In 2017, we join with the Palestinian prisoners’ movement in urging all organizations and people of conscience to organize actions for Palestinian freedom between 14 and 25 April 2017 in commemoration of Palestinian Prisoners’ Day. There are approximately 7,000 Palestinian political prisoners behind Israeli bars today: women, men, children and elders. Nearly 600 of them are held in administrative detention, imprisonment without charge or trial, while others face military courts with a conviction rate of over 99%. Hundreds of Palestinian children, as young as 12 years old, are held in Israeli prisons. Palestinian political leaders, including PFLP General Secretary Ahmad Sa’adat, Fateh leader Marwan Barghouthi, and Samira Halaiqa and 11 more members of the Palestinian Legislative Council, are held behind bars. This year, thousands of Palestinian political prisoners have announced that they will launch a hunger strike beginning on 17 April to achieve a list of demands, including an end to the prohibitions and cuts to family visits, proper medical care and an end to medical neglect and an end to isolation and administrative detention. This strike comes five years after the collective Karameh strike of 2012, and is once again a critically important struggle for justice. On Palestinian Prisoners Day, this week of action is an important time to support the Palestinian prisoners’ movement and leadership in struggle. Every day, Palestinian prisoners are on the front lines of struggle, facing torturous interrogation, nighttime raids, solitary confinement and relentless attacks on their rights at the hands of Israeli occupation forces. Those attacks are aided by international and corporate complicity, support and profiteering. Palestinian Prisoners’ Day is a critical time to stand against state and corporate complicity with Israeli imprisonment of Palestinian political prisoners. Every year, the United States provides over $3 billion in military aid to Israel. The European Union includes the Israeli National Police in research projects to further develop interrogation techniques, like LAW TRAIN. The US, Canada, UK and EU regularly defend Israeli oppression and occupation in international forums and even attempt to block Palestinians from seeking redress in international courts. The United States’ demands pressured the UN Secretary-General to remove a report by UN ESCWA on Israeli apartheid throughout occupied Palestine. This means that these states are partners in the imprisonment, isolation and torture of Palestinian prisoners. Corporations like Hewlett-Packard profit from the imprisonment of Palestinians; HP corporations have contracts to run and maintain the biometric ID system that subjects Palestinians to checkpoints and the Apartheid Wall, as well as the databases of the Israel Prison Service. British-Danish security corporation G4S sold off its Israeli subsidiary after massive BDS pressure internationally, but continues to invest in the Israeli police’s training institute, Policity. And it continues to profit from the deportation of migrants and imprisonment of children in the US, UK and elsewhere, among the prison corporations that profit from the mass incarceration of Black people and the targeting of oppressed communities. Internationally, Georges Ibrahim Abdallah, Lebanese Arab struggler for Palestine, has been imprisoned in French jails for 33 years. The demand for freedom for Georges Abdallah is part and parcel of the Palestinian prisoners’ movement. In the United States, the Holy Land Five are serving sentences of up to 65 years in prison, while longtime Palestinian struggler and community leader Rasmea Odeh will soon face deportation after her legal case has come to an end. On Palestinian Prisoners Day, we demand justice for all of these strugglers and prisoners for Palestine. Palestinian Prisoners’ Day in 2017, 17 April, also marks the 40-day anniversary of the Israeli assassination of Palestinian youth leader Basil al-Araj on 6 March. Palestinian youth have issued a call for organizing actions for 17 April to challenge Palestinian Authority security coordination with Israel; al-Araj and five of his comrades were imprisoned for months without charge by the PA, and the demonstration against the continued trial in PA courts against the youth was attacked by PA security forces. “On this day, we continue to demand an end to the Palestinian Authority’s security coordination with Israel. We call on Palestinian communities everywhere to use this moment as a first step in reorganising our communities and affirming our unwavering will for return, freedom and dignity,” emphasizes the statement. Samidoun Palestinian Prisoner Solidarity Network urges all organizations and groups that support justice, liberation and Palestinian freedom to organize events from 14-25 April in support of Palestinian prisoners, the prisoners’ movement’s collective hunger strike and demands, and the demand to end security coordination. 2017 is a year in which we mark 100 years of the Balfour declaration and colonization; 70 years of al-Nakba; 50 years of extended and intensified occupation. This is also the year to struggle for Palestinian freedom and support liberation for Palestinian political prisoners! Send your events and actions to us at samidoun@samidoun.net, on Facebook, or use the form to tell us about your actions. We will be publishing an international list of events and actions for Palestinian Prisoners’ Day. 1. Join the events to End Security Coordination on 17 April! Palestinian youth have urged the organization of actions on 17 April to end security coordination and free Palestinian prisoners, marking the 40th day after the murder of Basil al-Araj. Contact the organizers on Facebook/Twitter about your local activity. 2. Boycott HP and G4S! Highlight the role of corporations involved in – and profiting from – the political imprisonment of Palestinians by the Israeli occupation. Demand your university, institution or local government stop contracting with HP so long as it provides the technology for apartheid and imprisonment in Palestine. 3. Support Palestinian Students! Palestinian students are facing imprisonment, raids on their universities and invasions of their student councils. As we issue this call, Palestinian student Kifah Quzmar has been denied access to a lawyer, under harsh interrogation for 20 days. Fellow Palestinian student Istabraq Yahya Tamimi is under interrogation as a member of Bir Zeit’s student council. On campuses around the world, this week of action is a critical time to hold events, organize solidarity strikes, petition and pass resolutions to free Kifah Quzmar and hundreds of imprisoned Palestinians denied access to their education. 4. Hunger Strike for Justice! Palestinian prisoners have announced plans for a mass hunger strike beginning 17 April for a series of demands, including an end to prohibitions and cuts to family visits, proper medical care and treatment and an end to isolation and administrative detention. Organize an event, demonstration or one-day hunger strike tent in solidarity with the prisoners’ strike. 5. Cut Complicity! In the United States, 15 April is not only two days before Palestinian Prisoners’ Day – it’s also Tax Day, a great occasion to protest the US’ billions in annual aid to Israel. Palestinian Prisoners’ Day is also an important time to challenge programs like LAW-TRAIN or joint police training exercises, which work to build racism and oppression while providing cover to the violations of Palestinian human rights. 6. Build the Boycott, Divestment and Sanctions Campaign! Palestinian Prisoners’ Day is a great occasion to build your BDS campaigns against Israeli products in your community, or for academic, cultural and sports boycott. Buying and selling Israeli goods, or engaging in partnerships with Israeli cultural or academic institutions, means going into partnership for the imprisonment and torture of Palestinians. While Palestinian students are imprisoned and denied education, cultural workers are locked up and football players are imprisoned instead of on the field, BDS campaigns can help support Palestinians struggling for freedom. ← The People of Irian Barat Must Be Free! !